The first post of 2015 starts with a good news: I finally managed to get my UHD TV (LG 49UB850V) to work @ 60Hz with a chroma subsampling of 4:4:4 (more on GTX 970 + 4K TV HERE). This is confirmed with the THE QUICK BROWN FOX chroma torture test available in this post. I updated the LG UHD TV with the latest firmware (04.36.32) and the most important I think, is the update of the VGA BIOS of the MSI GeForce GTX 970: 84.04.2f.00.50. I also installed the latest R347.09 (Windows 8.1 64-bit). As I said in this review, the new VGA BIOS improved several things like GPU throttling or in our current case, the 4:4:4 chroma subsampling with a 4K resolution @ 60Hz. The GTX 970 is plugged to the LG TV using the HDMI 2.0 output port (GTX 970) and the HDMI 3 (10-bit) input port of the TV. I also set the HDMI UHD Deep Colour to ON (on the LG TV). 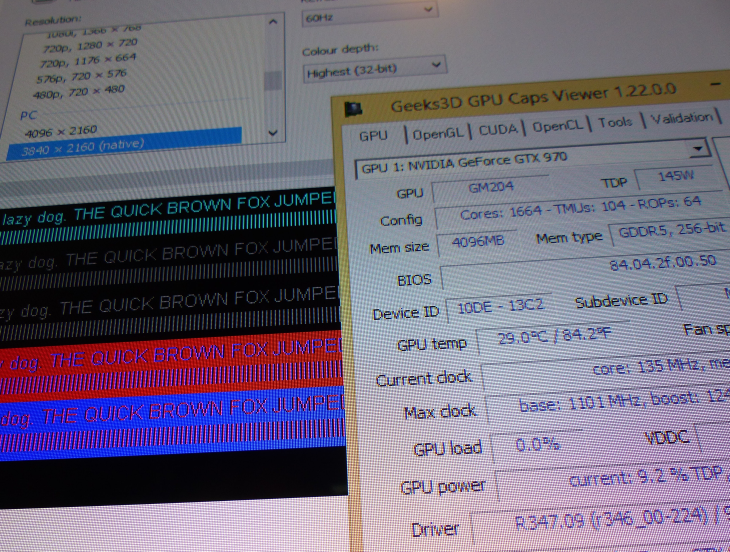 So today I can confirm that the team GTX 900 series + LG 49UB850V can work at 4K @ 60Hk 4:4:4. And better late than never, happy new year 2k15 to all Geeks3D’s readers! Great news and Happy new year ! I ve Gtx 970 too (mini itx) … Is simple to update bios VCard? And tv firmware… Just Connecticut tv to internet???? Is it true though that UHD TVs are not good for games? I heard something about bad motion resolution, which result in a lot of blur when motion is fast. Also i use the Original Cable supplied with the TV and finally i am not able to enable the UHD Deep Color because i get that annoying popup saying there is no connected device that supports this, offcourse all this in HDMI-3 of the TV. Great accomplishment!! This brings PC technology to a whole new level.Can you comment how well this works for office type apps excel etc? Also verification of performance on windows 10 would be nice. What about 42ub820v? Does this model support 4k@60Hz 4:4:4? Where to get the update for the bios for this card msi gtx 970 oc 4gd5t ? What cable did you use..?!!! Dear Sir, at first excuse my english. 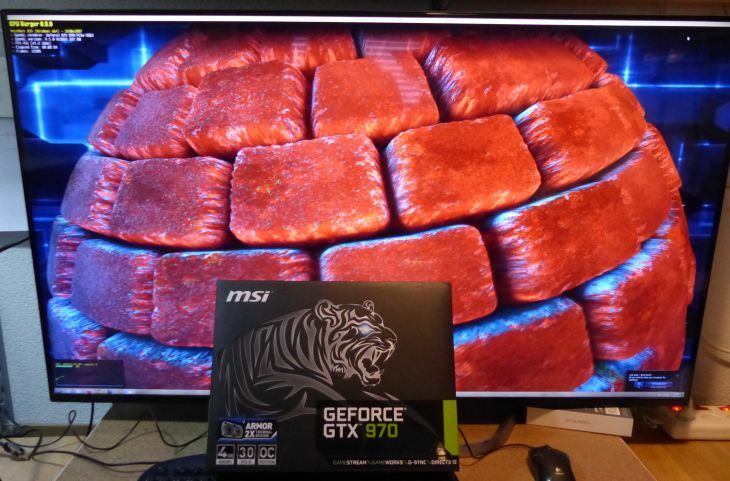 Today I found this website with test MSI GTX 970 with 4K LG 49UB850V @ 60Hz – 4:4:4. I´am using on my PC graphic card from Gigabyte GTX 950 Windforce and my question is. Will this tested LG TV work with my graphics card (GTX 950) connected through HDMI 2.0 cable without problems? Or could You recommending me, what to be more careful when choosing 4K UHD TV as a PC monitor, or do You have some overview other TV´s, which works fine? Thank You very much for Your posts.